Interview with Suranjit Sengupta Constitutional Reform: Where does the power lie? The Bangladesh Constitution: A restricted document framed by "copyright and ownership"
On the occasion of Constitution Day (November 4), DR KAMAL HOSSAIN -- one of the architects of the Constitution of Bangladesh -- takes the stand as KAJALIE SHEHREEN ISLAM questions him about the failure to realise the dreams and aspirations woven into it 38 years ago. FORUM: How do you view the recent developments regarding the courts' ruling of the fifth and seventh amendments to the Constitution illegal and void? 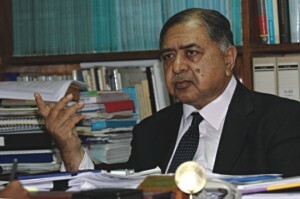 Kamal Hossain (KH): The developments are not recent as such. The Constitution was written in 1972. The extraordinary events and violent and extra-constitutional interventions of 1975 had assailed this Constitution using martial law proclamations to change it. The first major correction that took place was by High Court judgement in 2005 whereby the martial law decrees embodied in the so-called fifth amendment were declared void; 'so-called', because martial law cannot make amendments. The character of martial law is that it is intended to deal with some emergency or special situation and therefore it is said that the doctrine of necessity authorises measures to deal with that emergency or situation. Changing the basic principles of the Constitution cannot be treated as an emergency or a special situation calling for immediate action, there was no necessity. A fundamental principle of constitu-tionalism is that it is adopted on the basis of the will of the people and acquires the character of fundamental law. The supremacy of the Constitution arises from the fact that it derives its legitimacy from the will of the people. This is set out in Article 7 of our Constitution in clear terms. The constitutionality of this amendment was tested in the High Court and the 2005 judgement held that the fifth amendment was unconstitutional. When the matter was put before the Court, the Court acknowledged its responsibility to uphold the supremacy of the Constitution. This is a very important development. FORUM: How did it feel to be one of the architects of the supreme law of the land and how does it feel now, almost 40 years later? KH: The experience of making of the Constitution, in the Constitution Drafting Committee and in the Assembly itself, might be described as “the ecstasy of constitution making”, in which all of us shared the exhilaration of translating our dreams into the text of the Constitution. What was to follow was the harnessing of our national energies to make this Constitution work and to achieve the goals which we had set out in it. Today, we can only lament that the dreams, woven into the text of the Constitution are yet to be translated into reality. Pandit Jawaharlul Nehru, in response to a question once put to him about the greatest difficulty since independence, had said, “creating a just state by just means, perhaps creating a secular state in a religious country”. So many decades later, these words have a strong contemporary ring in our own society. FORUM: Where did we go wrong? KH: The years since making of the Constitution experienced assaults upon the Constitution. The cataclysmic events of 1975 led to the establishment of authoritarian martial law regimes. These led effectively to the disempowerment of people; the paralysis of democratic institutions such as parliament and an accountable administration, responsive to public needs and the public interest; and the erosion of law. The state became captive to an alliance of powerful groups. Power was concentrated at the apex and became progressively less and less accountable. Thus, even when military regimes were formally replaced by elected “civil” governments, it only introduced the formal trappings of democracy and control of the state became more and more a function of muscle and money. This in turn meant continued erosion of rule of law itself. Thus women and men have had to endure the agony of impediment after impediment being put in their way to realise the goals of the Constitution which was intended to provide the framework for a humane, just and democratic order in which all people could enjoy their basic human rights. FORUM: What were the basic principles of the Constitution when it was formed and on what were they based? KH: The roots of the four basic principles of the Constitution can be traced to the following elements which converged to produce that vision: i) the unifying role of nationalism ii) the conviction that democracy would harness people's power to liberate themselves from deprivation and social injustice iii) the belief that bringing social and economic transformation, through a democratic process, would create a just society and iv) that re-affirmation of the age-old non-communal tradition would sustain communal harmony and prevent the abuse of religion, discrimination and intolerance to gain power. The fundamental principles of State Policy as stipulated in Part II of the Constitution sought to spell out the vision of an exploitation-free society that we believed represented the aspirations of the people of Bangladesh. It provided that national unity and solidarity of the people of Bangladesh were bases of which the Republic was established. It further provided that a socialist economic society would be established with a view to ensure the attainment of a just and egalitarian society free from exploitation. It was provided that the Republic would be a democracy, in which fundamental human rights, freedom and the dignity of worth of the human person would be guaranteed and in which effective participation of the people through their elected representatives at all levels would be ensured. It was also provided that principle of secularism would be realised by the elimination of a) communalism in all its forms b) granting by the State of political status in favour of any religion c) the abuse of religion for political purposes and d) any discrimination against or persecution of persons practising a particular religion. These provisions reflected the collective determination of the people of Bangladesh to exorcise from the soil of Bangladesh those dark forces of communalism and religious bigotry which had wrought such horrors in our land. This, however, in no way precluded the full and free practice of religion by any person of his/her faith. The dreams which were woven into the constitutional demands were those of a democratic political order in which power would truly belong to the people, to be exercised through a sovereign parliament, composed of representatives elected on the basis of universal adult franchise. It was expected that the parliament would bring about social and economic transformation. It was clearly expected that the true representatives of the people would be totally committed to end exploitation through implementing programmes for fundamental economic and social change. FORUM: Does a two-thirds majority in the parliament allow a party to exercise power at will? KH: No. Constitutional power is more than ordinary lawmaking power. The basic structure of the Constitution -- such as independence of the judiciary, the secular character of the state, cannot be changed. Amendments to the Constitution can be made but through an extensive process of consultation and consensus building -- and not through a referendum either as military dictators claim. The Constitution declares in Article 7 that power of the state is derived from the people, and is to be exercised in accordance with the Constitution, by their elected representatives, chosen through free and fair elections. Power is thus made subject to constitutional limitations. The Constitution confers on the majority of those elected the right to form the government, but does not thereby confer on it arbitrary and unfettered power, but only power subject to the obligations laid down in the Constitution. The oath of office makes it clear that those who are assuming power are oath-bound to respect the Constitution, its fundamental principles, which defined the basic structure of the Constitution, and the fundamental rights of citizens, guaranteed by the Constitution. These constitutional obligations provide a shield against abrupt constitutional amendments by a transient majority for gaining some short-term political advantage, disregarding the national consensus on which the original Constitution was based. In a multi-party democracy, political parties have a vital role to play, but that role has to be played subject to the Constitution, which requires that power is to be exercised, strictly in accordance with the law and the Constitution, in the national and public interest. This requires fairness and impartiality in the making of public appointments, and dealing with public resources. The oath taken to exercise power in accordance with the Constitution and the law is a solemn pledge not to allow party considerations to prevail over national or public interest. The role of parliament and its members could become more effective if the functioning of parties could be brought into conformity with the mandates of the Constitution and law. FORUM: How can the dreams woven into the Constitution almost four decades ago be realised today? KH: We need to recognise the imperative of nurturing in civil society a durable unity based on a sincere commitment to certain core human values -- human dignity and the fundamental rights that derive from it, equality of all persons, equality before the law, equality of opportunity, the rule of law including independence of the judiciary. This unity must transcend the diversity of ethnicity, gender, religion, or political affiliation which tend to divide us. We must be vigilant to ward off the threats to this unity and assaults upon it from those powerful forces who feel threatened by a strengthened civil society. These forces exist in every society -- a mutually-supportive alliance of power and wealth, which are self-serving and willing to use any means to achieve their purposes. Examples abound of how they promote violence, discord and division by inciting communal and ethnic conflict, thus undermining the development of democratic institutions. Where these forces prevail we witness the phenomenon of the cartelisation and criminalisation of politics, and the consequent disempowerment of people and weakening of civil society. We must never compromise on core human values for short-term political or commercial advantage, or in response to narrow parochial, partisan or communal loyalties. Healthy politics and the spirit of the young generation are what brought us liberation from oppressive foreign forces as well as from local autocratic rule. These, mobilised by the media, are what can bring change today. Instead of engaging in unnecessary controversies, we should be positive, constructive and forward-looking, upholding and realising the true vision of the Constitution, which was the development and betterment of all people. FORUM: Does the failure to realise the dreams embodied in our Constitution only frustrate or do you believe that there is still room for hope? KH: Dr. Ambedkar, one of the architects of the Indian Constitution, said, “If atrocities against the impoverished and oppressed untouchables do not stop, I would myself like to burn the Constitution.” Many of us may have shared this sentiment at times, when we see provisions in constitutions which proclaim that all power belongs to the people, and guarantee fundamental rights, including economic and social rights, reduced to mere paper pledges. The proper response is not to burn constitutions, but to make them into living realities. This is possible if citizens resolve to play a proactive role as members of a vibrant civil society so that the pledges that “we the people” -- the opening words in our Constitution -- had made to ourselves, may be truly fulfilled. We are far from the vision of the Constitution, but if we follow its principles -- some of which are similar to the pledges outlined in the government's charter for change -- we may come close to fulfilling it.